The OM-CP-MICRORHTEMP is a miniature, battery-powered, stand-alone temperature and humidity data logger. This device combines the latest in low-power technology with Windows based software to provide a next-generation temperature and humidity recorder. The data logger records 16,383 humidity and 16,383 temperature measurements simultaneously. 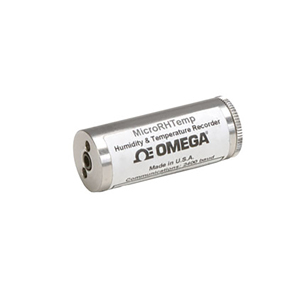 The OM-CP-MICRORHTEMP is a major leap in both size and performance. Its real-time clock enables all data to be time and date stamped. The storage medium is non-volatile solid state memory, providing maximum data security even if the battery becomes discharged. Its small size allows the device to fit almost anywhere. Data retrieval is simple. Plug it into an available COM port and the easy-to-use Windows software does the rest. The OM-CP-MICRORHTEMP requires minimal effort to configure and control. The software used to operate the OM-CP-MICRO-RHTEMP requires no programming skills and enables users to effortlessly select reading rate and device ID. Data collection can start moments after connecting the hardware. A simple plug-in connection is all that is required to connect the OM-CP-MICRORHTEMP to a PC. Data can be printed in graphical and tabular format or exported to a text or Microsoft Excel file. 참고: Operator's manual and USB cable are included with the OM-CP-IFC202 Windows software (software is required to operate the data logger and is sold separately).